It may be the most critical area in your warehouse- the bridge between what’s coming in and going out. 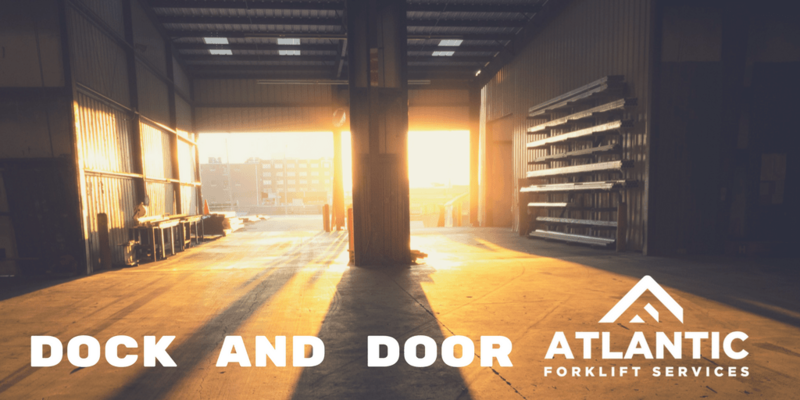 The loading dock and doors need as much love and maintenance as any other part of your facility, and Atlantic Forklift Services can help ensure your loading dock stays safe and functional at all times. Little accidents and regular daily wear-and-tear can beat up a loading dock pretty good. AFS technicians and experts can conduct a thorough inspection of your dock area to identify potential trouble areas. Dock operation is much more complicated than just moving materials in and out- there are lighting and safety systems, vehicle restraints, pedestrian and vehicle regulations, safety bumpers and barriers and hydraulic lifts and levelers. All of these need to be inspected and maintained regularly. Remember, too, that forklift operation on a loading dock is significantly different than in a warehouse. Your operators will need to know how to maneuver in and out of a truck, and up and down ramps while carrying loads. All of this is covered in basic forklift operator training and we’re always available for a refresher if one of your operators needs it. Don’t take your loading dock for granted, it is so much more than the ingress and egress for your facility. Our technicians and experts can keep your loading dock running safely and smoothly- ensuring your facility just keeps humming along as well. Call us with any questions as (704) 842-3242.